In Zombie survival, choose your provisions to survive a Zombie apocalypse. Each player selects items to place in their house, including weapons, lumber, gas, first aid, etc. 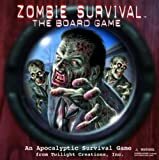 Second part of the game brings your fears to light as the zombies start heading towards your house, tearing down your barricades and creeping in. You may have a chance to make it to town for some additional supplies, hopefully avoiding the zombies there, leaving your family to defend against the walking Dead. Did you prepare for the possible power outage, contaminated water, sickness and fatigue? how long can you feed your family and keep them healthy? the best prepared will win. Contains 4 houses, 16 yard pieces, 4 cheat sheets, 4 Tracker cards, 3 tile sheets of items, 52 glass beads, 54 town item cards, 20 event cards, 6 six-sided dice and 140 zombies.